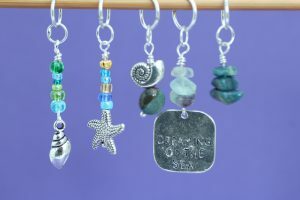 I love using stitch markers in my knitting and crochet projects. 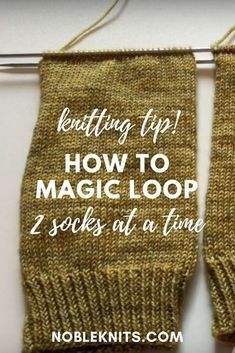 I find them both practical (I rarely if ever make a mistake in pattern repeats when using them) as well as beautiful (I like the effect of their movement and glitter as I work). 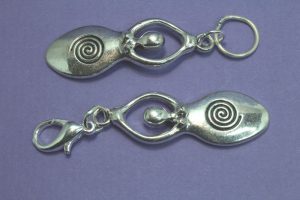 My favourite stitch markers have some sort of meaning for me; perhaps I made them from an old pair of earrings belonging to my mother; perhaps they were given to me by a friend; perhaps they have an intrinsic symbolism, such as Buddhist and Pagan iconography. You can see all of my Buddhist stitch markers in the Granary Knits Etsy store and I am starting to introduce Pagan symbols as well, so keep an eye on the shop for new additions. 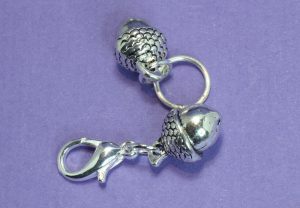 I have been making a lot of new stitch markers recently. Some are themed and relate to the natural world that inspires me, such as Dreaming of the Sea and Deep in the Forest. Deep in the Forest . . . something stirs! 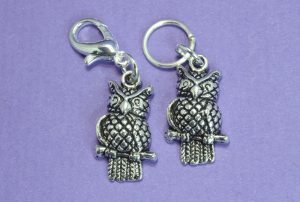 This month’s new listings feature lots of new stitch markers, a brand new stitch marker set, and some fabulous earrings. 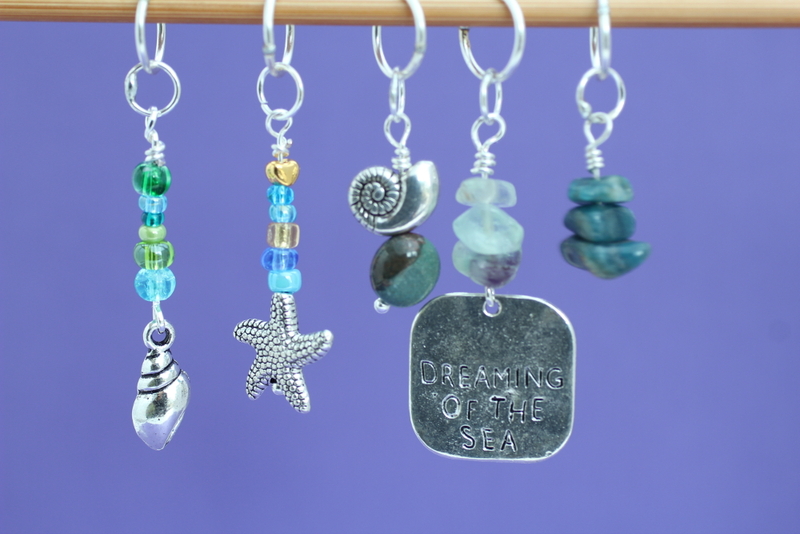 First of all, thank you to all my customers who have bought the Dreaming of the Sea and Sun Moon and Stars marker sets; it’s wonderful to see that themed sets of stitch markers have struck a chord with people in many countries. Today’s new stitch marker set is called Deep in the Forest. 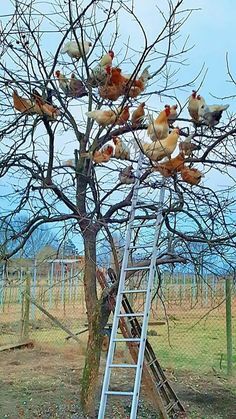 I love trees, the stillness in a forest when you can almost hear the earth breathe, the rustle of small creatures in the undergrowth, the earthy smell of woodland after rain. 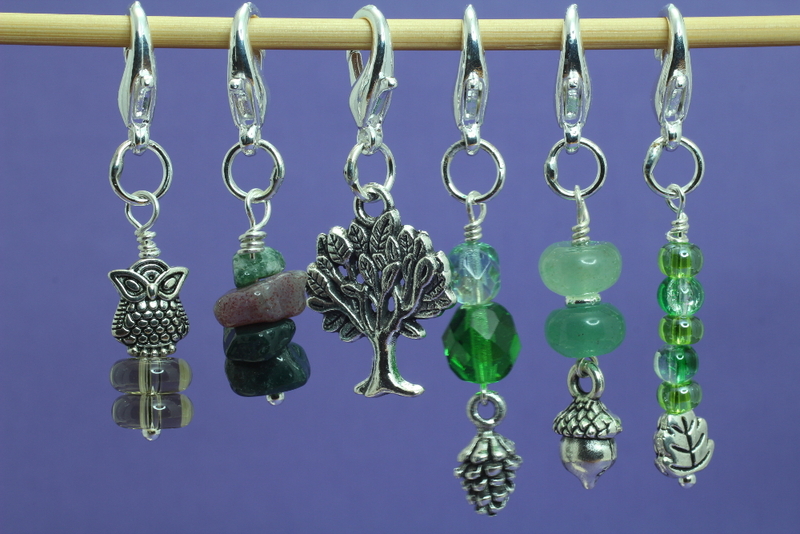 I have tried to capture this feeling in Deep in the Forest, a set of six stitch markers featuring gemstones and glass beads in shades of green, and charms that represent the elements of a forest that I love. 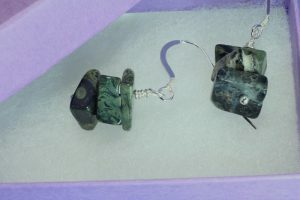 Gorgeous greens from the Fancy Jasper, Aventurine and glass beads, earthy tones from the Smoky Quartz and the Jasper again. This set is available as both knitting and crochet markers. There are lots of new single markers, too, some with a 5 for the price of 4 option. Continuing the forest theme, there is a large solid acorn marker and an owl marker. 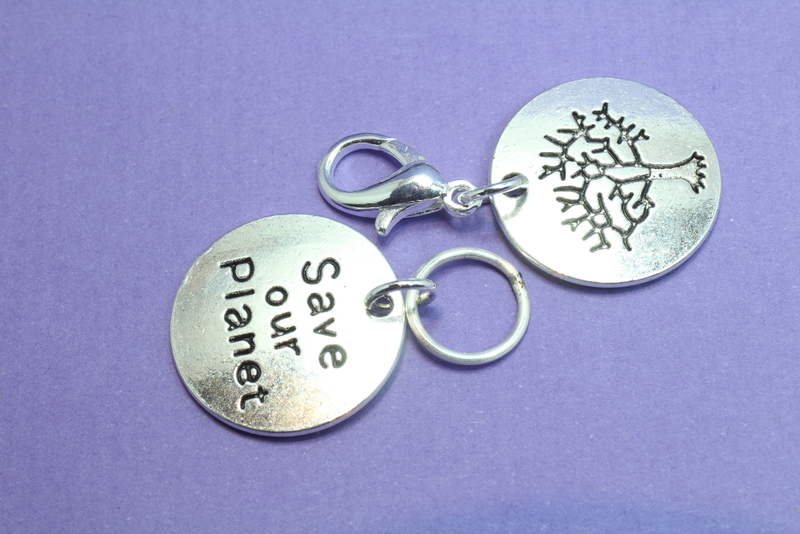 And a stylised tree etched onto a round charm with a reverse stating Save our Planet, a sentiment I’m sure we can all subscribe to! 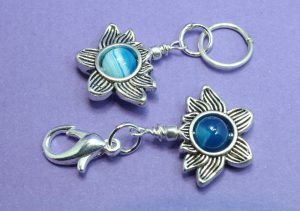 Another large stitch marker added to store today is the beautiful spiral goddess, a real beauty. 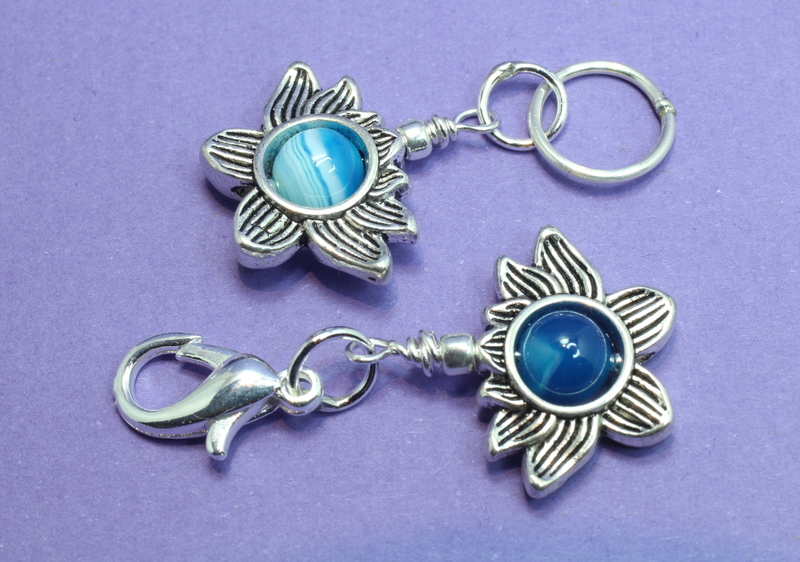 The final two markers added this week are a pretty combination of charms and gemstones. The Lotus Flower is a popular and familiar symbol and I love searching out new forms of this icon. This double-sided charm has an opening so that a bead can be inserted into its heart. I have used blue banded agate in this marker, with lots more lovely gemstones to choose from if they prove popular! 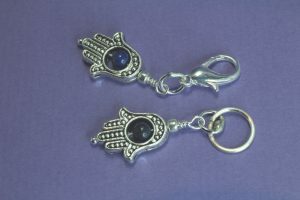 The Hamsa Hand, or Hand of Fatima, is another favourite symbol, and I have found a charm which again has a hole in the centre just right for a small gemstone bead. This one feature Lapis Lazuli, one of my favourite gemstones, glinting with specks of golden pyrite. The beads in both the Lotus and the Hamsa are free to move, and turning them is a great way to meditate whilst you are knitting or crocheting. 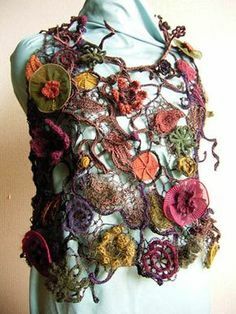 New items of jewellery are always fun to design and make, especially those pieces involving knitting or crocheting with wire. 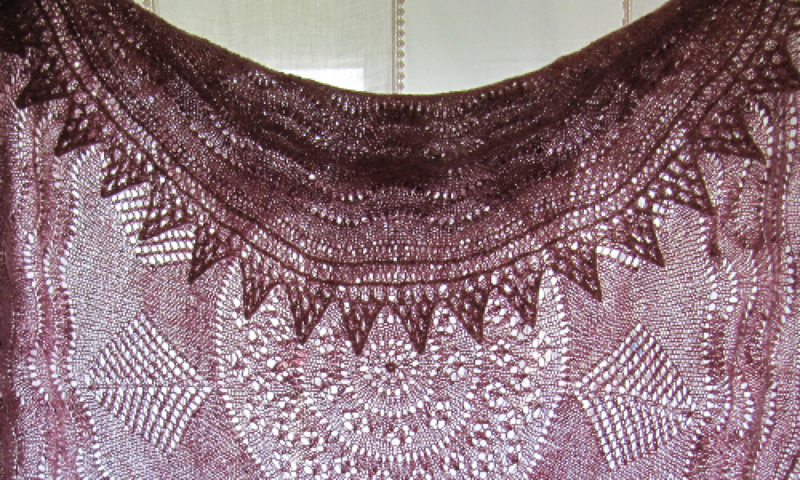 And adding gemstones is just so satisfying! The Moonstone Flower earrings were no exception. The pale grey Moonstone I have been using has an exceptional glow in its depths as well as a beautiful sheen. 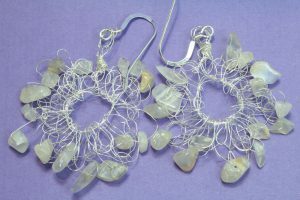 These were crocheted using 99.9% pure silver wire and each earring has fifteen glowing milky grey chips in its five petals. The last item for today features a gemstone new to me: Kambaba Jasper, also known as Crocodile Jasper. 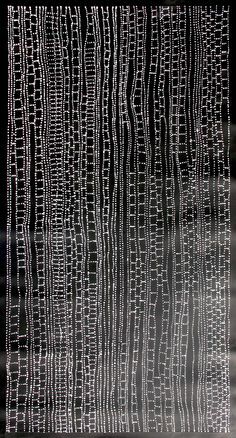 It comes from Madagascar, and has a very distinctive colour and patterning, not unlike the skin of a crocodile, in fact. As with all Jaspers, it is a spotty stone, although the spots here are rather larger than, say, in Dalmatian Jasper. 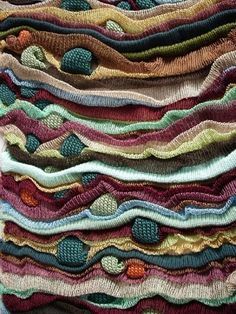 The main colour is a moss green, with the spots and streaks in black or very dark green. These chips are square cut, giving the earrings a contemporary look. 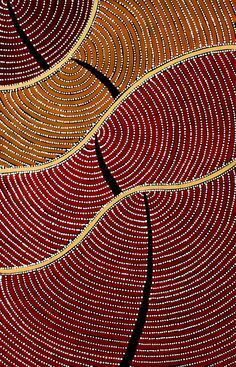 I hope you have found something to delight and inspire you in this week’s new listings. 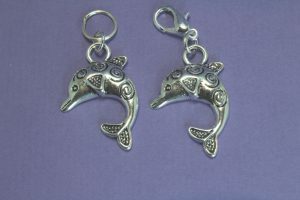 Keep checking back for new items, or follow me on Etsy to get all the latest updates.